Violet Lim, MECM, is the heart and soul of Lunch Actually – a matchmaking company that she founded with her thenfiancé, now-husband Jamie Lee back in 2004. Her inspiration came from observing her friends and colleagues who did not have time to date, due to their busy lives around work. Today, Lunch Actually is Asia’s biggest premier lunch dating company with offices in Singapore, Hong Kong, Malaysia, Indonesia and Thailand. Together with Jamie, Violet also founded esync to fill the gap in the market for trusted online and offline dating service platforms, LunchClick, the dating app for serious singles to help them meet offline as soon as possible, as well as Lunch Actually Academy, the date coaching service to maximize singles’ dating success. Her most recent venture is Viola.AI – the world’s first blockchainpowered lifelong love AI to help singles and couples across their relationship stages. Violet was the first Asian to be certified by the Matchmaking Institute in New York City, and she is the pioneer in her field. She has appeared in over 4,500 media coverages in top local and international media such as FOX, Forbes, CNN, BBC, Bloomberg, Mashable, The Straits Times, ABC News 20|20, CNBC Asia and Radio Australia. She’s also a renowned public speaker, recently spoke at TEDxNTU in Singapore, PR Asia 2018, Southeast Asia CFO Vision, Asian Women in Leadership Summit, and more. 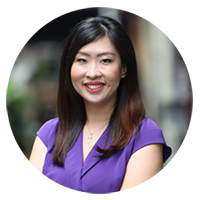 On top of her role as CEO and spokesperson of Viola.AI and Lunch Actually Group, Violet is active in Entrepreneurs’ Organization (EO) Singapore where she previously served as its Chapter President. She’s also a Winner at Women Entrepreneur Award 2017 in Singapore; for her achievement in demonstrating outstanding entrepreneurial qualities. She also sits on the board of Matchmaking Institute and is the Executive Director and the Principal Trainer of Matchmaking Institute of South East Asia where she trains matchmakers and aspiring matchmakers from all around the world. She is a past President at the Rotary Club of Suntec City and a current Committee Member of Shirin Fodzar.